Background and objectives Infection and cardiovascular disease are leading causes of hospitalization and death in patients on dialysis. The objective of this study was to determine whether an infection-related hospitalization increased the short-term risk of a cardiovascular event in older patients on dialysis. Design, setting, participants, & measurements With use of the United States Renal Data System, patients aged 65 to 100 years who started dialysis between January 1, 2000, and December 31, 2002, were examined. All hospitalizations were examined from study entry until time of transplant, death, or December 31, 2004. All discharge diagnoses were examined to determine if an infection occurred during hospitalization. Only principal discharge diagnoses were examined to ascertain cardiovascular events of interest. We used the self-controlled case-series method to estimate the relative incidence of a cardiovascular event within 90 days after an infection-related hospitalization as compared with other times not within 90 days of such a hospitalization. Results A total of 16,874 patients had at least one cardiovascular event and were included in the self-controlled case-series analysis. The risk of a cardiovascular event was increased by 25% in the first 30 days after an infection and was overall increased 18% in the 90 days after an infection-related hospitalization relative to control periods. Conclusions The first 90 days, and in particular the first 30 days, after an infection-related hospitalization is a high-risk period for cardiovascular events and may be an important timeframe for cardiovascular risk reduction, monitoring, and intervention in older patients on dialysis. Cardiovascular disease and infection are leading causes of hospitalization and death in patients on dialysis (1). Intriguing data in the general population have suggested the possibility that the two are interrelated and, more specifically, that infection may increase the risk of cardiovascular events (2). Biologically, infections may have acute effects on the vascular endothelium, (3) may alter the hemostatic system resulting in procoagulation (4,5), and/or may create a chronic subclinical inflammatory state that influences atherogenesis, progression of atherosclerosis, or both (6). Some studies in the dialysis population suggest that infection may contribute to the risk of cardiovascular events in this population as well (7,8). Previous studies in the dialysis population were limited by the select types of infection examined (bacteremia or sepsis) and analytic approaches that compared patients who acquired infection with patients who did not acquire infection, patients likely to differ in ways not easily measured, thereby resulting in residual confounding. Given the median age of incident dialysis patients of 64 years (1), the burden of infections in older patients on dialysis (9) and the potential cardiovascular consequences of infection, we sought to examine whether an infection-related hospitalization increased the subsequent short-term risk of a cardiovascular event in older patients on dialysis. The source population included patients with ESRD without a prior history of renal transplant who newly initiated dialysis between January 1, 2000, and December 31, 2002. We restricted the cohort to patients aged 65 to 100 years and to patients with a known dialysis modality. We examined all hospitalizations from study entry until kidney transplantation, death, or study end December 31, 2004. The final cohort includes all patients with at least one cardiovascular event because the self-controlled case-series method we used requires only cases (patients with a cardiovascular event). The study was conducted using the United States Renal Data System Nutrition (USRDS), a national database that includes data on demographics, dialysis modality, comorbidities, laboratory measures (e.g., serum albumin and hemoglobin), inpatient hospitalizations submitted to Medicare, renal transplantation, health insurance coverage, and death (10). We utilized data from the Patient Profile, Payer History, Medical Evidence Form, Transplant, and Hospitalization Standard Analytic Files. The exposure of interest was infection-related hospitalization, defined as any hospitalization with a discharge diagnosis of septicemia, bacteremia, peritonitis, endocarditis, soft-tissue, pulmonary, genitourinary, gastrointestinal, joint, or bone infection (see the Appendix for the specific International Classification of Disease, 9th Revision, Clinical Modification [ICD-9-CM]) codes used to define infection-related hospitalization). All discharge diagnoses were examined for infections of interest. The date of discharge was used as the date of infection in all analyses because the actual date of infection could not be ascertained from claims data. In addition, by using the date of discharge, we were assured the infection had occurred by this date. The primary outcome of interest was hospitalization for myocardial infarction (MI), unstable angina, stroke, or transient ischemic attack (see the Appendix for specific ICD-9-CM codes used to define cardiovascular events of interest). Only primary discharge diagnoses were examined to ascertain cardiovascular diagnoses of interest. We elected to examine only primary discharge diagnoses for cardiovascular events to reduce misclassification because of the strong possibility that prior (preadmission) cardiovascular events (past MI or stroke) would be coded among the secondary discharge diagnoses. The date of admission was used as the date of the cardiovascular event as we assumed there was a high likelihood the event had led to hospitalization. All hospitalizations from the start of dialysis were examined for infection-related and cardiovascular diagnoses. We did not to exclude the first 90 days of dialysis because the first 90 days was felt to be an important period to include for study and because there was only a 2% difference in the percentage of patients in the source population who had Medicare as the primary payer by day 90 (77% as compared with 75%). We used the self-controlled case-series method (11,12) to estimate the association between infection-related hospitalization and cardiovascular events. The self-controlled case-series method compares the risk of an acute event, in this case a hospitalization for a cardiovascular event, within an individual during times of exposure and nonexposure. This analytic method includes only those patients with the outcome of interest, defined as cases, and provides relative incidence estimates of the event within predefined periods of exposure relative to all other observation periods. The self-controlled case-series method derives relative risk estimates from cases only and therefore only patients with cardiovascular events during follow-up were included in the final analysis. The self-controlled case series allows one to examine how the risk of a cardiovascular event changes during times of infection, but only those participants with at least one cardiovascular event contribute to the risk estimate. In addition to providing direct estimates of relative incidence when exposures are transient and change over time, the case-series method has the added merit of controlling for fixed confounders. Thus, fixed factors, such as genetics, severity of underlying disease, and coexisting medical illnesses, which may not be accurately ascertained and therefore not fully accounted for in other statistical models, are controlled for in the self-controlled case-series analysis, as each individual serves as his or her own control. For our analysis, the transient exposure period was defined as the 90 days after an infection-related hospitalization. This period was selected a priori based on previous literature (2) and the hypothesis that the predominant acute effects of infection on vascular endothelium and the coagulation cascade would occur in the period immediately after infection. Given that our primary goal was to examine acute as opposed to chronic effects of infection, the overall risks from 1 to 90 days as well as 1 to 30, 31 to 60, and 61 to 90 days after an infection-related hospitalization were examined. The nonexposure or baseline/control period varied for each individual depending on the total observation time and the time free of infection-related hospitalization. Figure 1 graphically illustrates the exposure and control periods for two individuals used in the self-controlled case-series method. In the primary analysis, age was controlled for in three groups: 65 to ≤75, >75 to ≤85, or >85 years. The exposure period is defined as the 90 days after an infection-related hospitalization (dark boxes). The control period for an individual includes all days in the observation period that are not during an exposure interval (gray boxes). For example, patient A had one infection-related hospitalization during follow-up and one myocardial infarction (MI) in the control period. Patient B had two infection-related hospitalizations and therefore two 90-day exposure periods during follow-up. Patient B had one MI in the first exposure period and none in the control period. Relative incidence estimates are derived from comparing rates of cardiovascular events between exposed and control periods, and the length of follow-up may be different for different patients, as illustrated with patients A and B. Each patient serves as their own control (self-controlled) and the method focuses on event rates in the exposure and control periods within each individual's observation period. Combining this information across all study individuals provides an estimate of the relative incidence. In sensitivity analyses, we examined whether the relative incidence of a cardiovascular event after infection was affected by the type of infection (any infection compared with septicemia, pulmonary, or genitourinary) or the cardiovascular event of interest (analyses limited to MI and stroke only). We also examined whether separating the analyses based on seasonal variation (April through September and October through March) altered results substantially. Last, we examined age across five rather than three groups (age 65 to ≤72, >72 to ≤79, >79 to ≤86, >86 to ≤93, and >93 years). After exclusions, a total of 138,665 patients were included in the source population. Of those patients in the source population, 16,874 patients had at least one cardiovascular event of interest during follow-up and were therefore included in the self-controlled case-series analysis (Figure 2). The mean age of patients included in the self-controlled case-series analysis was 75 years, 48% were male, 39% had prevalent ischemic heart disease, 57% had prevalent diabetes, and 95% were on hemodialysis (Table 1). The mean duration of follow-up was 2.1 years. Source population and exclusions resulting in final case-series cohort. The 16,874 patients included in the analysis contributed 20,133 cardiovascular hospitalizations and 25,765 infection-related hospitalizations (Table 2). 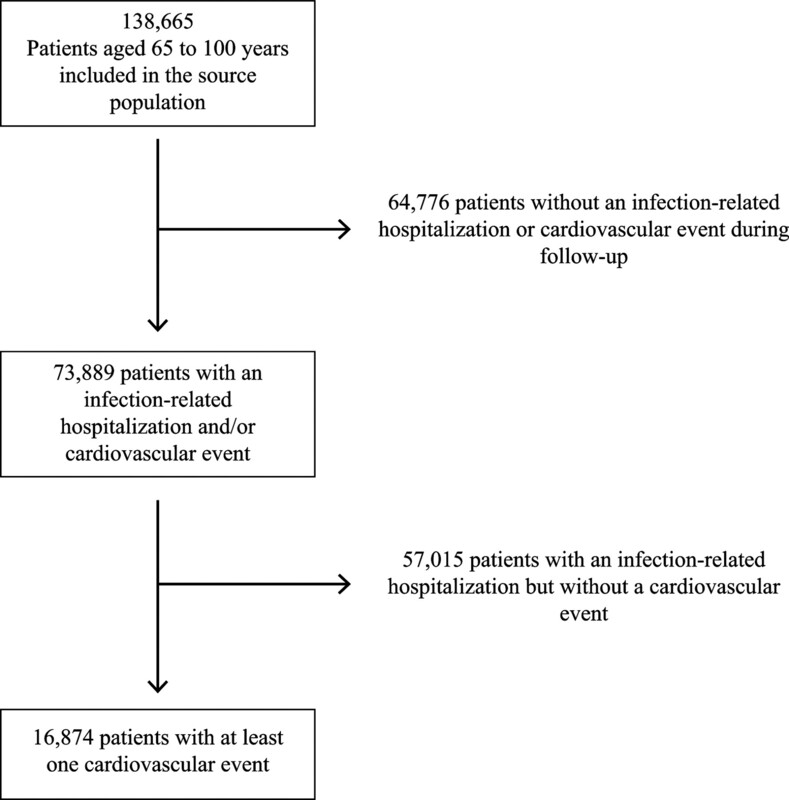 The age-adjusted relative incidence of a cardiovascular event during the 90-day period after any infection was 1.18 (95% confidence interval [CI] 1.13 to 1.24), corresponding to an 18% increase in the risk of a cardiovascular event after an infection-related hospitalization. When risk was examined in 30-day time increments (days 1 to 30, 31 to 60, and 61 to 90), the risk of experiencing a cardiovascular event changed over time and was highest in the first 30 days (relative incidence 1.25; 95% CI 1.18 to 1.33), declining to a relative incidence of 1.17 (95% CI 1.09 to 1.26) at 31 to 60 days and to a relative incidence of 1.08 (95% CI 1.00 to 1.17) at days 61 to 90 (Table 3). When specific infections were examined (septicemia, pulmonary, and genitourinary), each was associated with an increased risk of cardiovascular events in the 90 days after an infection. For pulmonary and genitourinary infections, the highest risk was in the first 30 days after infection, whereas with septicemia the risk remained elevated throughout the 90-day follow-up period (Table 3). If the cardiovascular events of interest were limited to only MI or stroke, similar to the above observations, the relative incidence was increased 19% (95% CI 1.13 to 1.25) in days 1 to 90, with the highest risk in days 1 to 30 (Table 3). There were no material differences in results when accounting for seasonal effects or when controlling for finer age groups (results not shown). Our study found that infection-related hospitalizations were associated with an increased risk of subsequent cardiovascular events. The relative incidence of these cardiovascular events was highest in the first 30 days after an infection-related hospitalization and numerous types of infection (septicemia, genitourinary, and pulmonary) were associated with an increased risk of cardiovascular events in this cohort of older dialysis patients. Our analyses show the postinfection period to be a particularly high-risk period for cardiovascular events, which could have clinical implications because this is a potential timeframe for directed and intensive risk reduction and targeted therapeutics. Furthermore, our findings reinforce the far-reaching consequences of infection beyond traditionally considered infection-related outcomes. Atherosclerosis is a complex biologic process that is mediated in part by immune mechanisms, with atherosclerotic lesions containing immune and inflammatory cells. Systemic inflammation and microbial pathogens can stimulate T cells, macrophages, and mast cells, resulting in plaque instability and local thrombus formation at the site of plaque rupture (13). Inflammation via the acute-phase response increases plasma levels of a variety of proteins that alter the coagulation cascade, modify lipoprotein structure and function, and change vascular smooth muscle and function (3), suggesting that cardiovascular events after infection may involve processes beyond that of simply triggering thrombosis in an already injured vessel. Thus, it is reasonable to postulate that infection, regardless of type, results in inflammation and augments the pathogenesis of vascular disease through a variety of proximate mechanisms. Our findings are similar to previous studies in patients with and without ESRD. Smeeth et al. used the United Kingdom General Practice Research Database and self-controlled case-series method to examine the relation between a respiratory or urinary tract infection and subsequent MI or stroke (MI and stroke were examined separately as outcomes of interest) in a general medical population (2). These investigators found the relative incidence of a MI was two- to five-fold higher in the first 28 days after a respiratory infection and remained 1.4-fold higher in days 29 to 91 after a respiratory infection; a significantly increased risk of MI was also observed after a urinary tract infection, albeit with lower incidence ratios than for respiratory tract infections. Similar to the observed increased risk of MI, each infection was associated with an increased incidence of subsequent stroke (incidence ratios of 1.7 to 3.2 in days 1 to 28 and 1.2 to 1.3 in days 29 to 91). Few studies have examined the relation between infections and cardiovascular events in the dialysis population. Foley et al. used USRDS data to examine the relation between the first episode of septicemia and subsequent cardiovascular events (including MI, congestive heart failure, stroke, and peripheral vascular disease) (7). They found that, in the 6 months after septicemia, the risk of MI or stroke was increased approximately four-fold and remained more than 1.5-fold higher 5 years after the first episode of septicemia. Ishani et al. examined data from the USRDS Dialysis Morbidity and Mortality Study Wave 2 and the relation between first episodes of septicemia or bacteremia and subsequent MI, heart failure, peripheral vascular disease, and stroke. In this study, the risk of MI was increased by 78% and the risk of stroke was increased two-fold after bacteremia or septicemia (8). Our study extends these findings in several important ways. First, we examined a range of acute infections rather than just bacteremia or septicemia, which may have unique cardiovascular consequences as compared with other infections. Second, we used the self-controlled case-series method, thereby reducing potential residual confounding. Finally, we examined how risk changed in the first 3 months after an infection, a period that may be particularly important for intervention and risk reduction. The overall higher risk estimates observed in prior studies may be due to residual confounding, as patients who do and do not acquire infection are likely to be different in important ways that cannot be measured or easily adjusted for. Although not entirely eliminated, residual confounding can be mitigated using the self-controlled case-series method. The strengths of our study include the selected study population, older patients on dialysis, a high-risk population with frequent infections that warrants careful examination and further understanding of the consequences of infection. Second, we used the self-controlled case-series method, an analytical method that allows for understanding of how risk changes after transient exposures such as infection-related hospitalization and allows each participant to serve as his or her own control. The limitations of our study include nonascertainment of outpatient infections, inability to determine the specific date of infection during hospitalization, and reliance on ICD-9-CM codes as opposed to validated clinical criteria. Because infections of lesser severity (that do not require hospitalization) may also influence the risk of cardiovascular events, noninclusion of these infections would have resulted in misclassification of our key exposure, possibly attenuating the risk estimates. Assuming the date of infection to be the hospital discharge date may have altered the specific risk estimates for the incremental time periods examined, but would not have materially influenced the study's qualitative findings. Although there are standard criteria by which to diagnose MI, unstable angina, stroke, and transient ischemic attack are less uniformly well defined; thus, numerous events may have been misclassified or not ascertained. Although reliance on the primary ICD-9-CM discharge diagnosis for cardiovascular events would have increased our specificity for new versus prior events, this strategy also contributed to the underascertainment of events. Finally, we cannot exclude that other elements of hospitalization contributed to the excess risk of cardiovascular events after an infection-related hospitalization. However, in the self-controlled case-series method, the baseline risk is based on the occurrence of cardiovascular events during all non–infection-related periods, including periods during or after non–infection-related hospitalization. Therefore, cardiovascular events after hospitalization for non–infection-related causes or cardiovascular events independent of hospitalization contribute to the baseline risk estimates. We found a substantial increase in the risk of cardiovascular events after an infection-related hospitalization, predominantly in the first 30 days. Further prospective studies are needed to better understand the mechanisms linking infection to cardiovascular events in patients with ESRD and whether interventions during this interval can alter the course of cardiovascular disease in patients on dialysis. This publication was made possible by Grant UL1 RR024146 from the National Center for Research Resources (NCRR) and Contract N01-DK-7-0005 from the National Institutes of Diabetes and Digestive and Kidney Diseases. The manuscript contents are solely the responsibility of the authors and do not necessarily represent the official view of NCRR or NIH. The interpretation and reporting of the data presented here are the responsibility of the authors and in no way should be seen as an official policy or interpretation of the United States government. Findings from this study were presented as a poster presentation at the annual meeting of the American Society of Nephrology; November 16 through 21, 2010; Denver. The International Classification of Disease, 9th Revision, Clinical Modification [ICD-9-CM]) codes are used to define infection-related hospitalization and cardiovascular events.